It is just this sort of credible character building that makes Ricky’s terrifying apocalyptic novels credible. He offers a brief outline of this plot – ‘Left behind after the military evacuation and separated from their families, the people of Storm Lake must decide what to do. Food has spoiled; technology stopped working and everyday life turned upside down. There are no answers, only questions and tough decisions to be made. 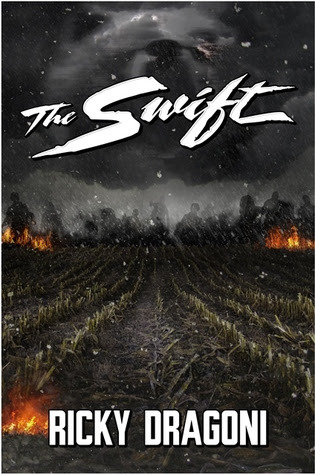 As they search for help in the cornfields of rural Iowa, a deadly game of hunter and prey develops between them and the Swift. The Swift are mysterious and ruthless creatures who hunt to kill. They unexplainably appear after the event and mercilessly dispatch of anyone who they encounter; while Coach Mike, Levi, his pupil, and those left behind must hunt the Swift for sustenance and survival. Go along this dark and twisted journey with Coach Mike and Levi as they do the unimaginable to survive in this apocalyptic new world, all in hopes of one day reuniting with their families. ‘ The ending of this tale will astound you! There is so much talent in the creative mind of Ricky Dragoni that reading a couple of his books creates a need to read more. Very fine story on every level.